Kancha Ilaiah, professor and director at the Centre for the Study of Social Exclusion and Inclusive Policy at the Maulana Azad National Urdu University in Hyderabad, recently changed his name (external link) to Kancha Ilaiah Shepherd in protest against the violence of caste. Professor Shepherd tells Rediff.com's Shobha Warrier about the implications of the BJP's victory in Uttar Pradesh for India. What was your reaction when you saw the BJP's huge win in UP? It was a feeling of disbelief. I was sitting all through at the Times Now studio. The general report I was getting was not this. What feedback did you get during the elections? I thought the SP-Congress combine would muster enough seats to be the single largest group. It appears the BSP failed to consolidate Dalit votes, and quite a lot of Dalits voted for the BJP. What made the Dalits vote for the BJP? It appears they felt that even if Mayawati came to power, she would not make any difference to their lives. Mayawati has not emerged as a leader who can take on the challenges of Narendra Modi and Akhilesh Yadav. Narendra Modi is a very challenging leader and Amit Shah is a good organiser at the ground level. They worked out caste-social engineering much better than what Mayawati did with the Dalits and Muslims. What kind of social engineering did Amit Shah do this time? They organised all the backward classes except the Yadavs and promised them several things; that the chief ministerial candidate would be from the OBC community, that they would improve their economic conditions, that they would give free gas connections to all their women, etc. Do you feel Mayawati failed as a leader of the Dalits? She could not become a national leader inspiring all the Dalits in this country. Within UP, the BSP's massive mandate in 2007 was because of the alliance she cobbled up with the Brahmins and the Dalits. At the ground level, she has not delivered and could not manage the unity of social causes. She also did not prove to be a developmental administrator. She could have improved the education of Dalits by starting many English medium schools, but what she did was she went on to build statues. She became quite diffident and later began to lose confidence also. She couldn't speak spontaneously; she was reading out notes written by somebody else at public rallies. This did not go down well with the masses. In that context, do you think Modi's oratorical skill worked for him and the BJP? Modi's asset is his absolutely rural kind of communication. Though his Hindi is not the UP or Bihar Hindi, he communicates very powerfully. Secondly, he has a cadre-based party network that mobilises a lot of people to listen to him. And he communicates to them effectively. The entire media, both electronic and print, which is anti-Congress now, also helps spread what Modi says including his Mann ki Baat. Whatever Rahul Gandhi says does not get the same kind of attention. Is it not true that there is a lot of difference in what Modi says and what Rahul Gandhi says? And how they say it also? I agree. Rahul Gandhi does not create any impression with what he says. He is a very normal communicator and he does not come with any new ideas as a political leader. He works like a social activist. In fact, he works better as a social activist than a political leader, somehow the Congress party does not understand this. Sonia Gandhi seems to have completely withdrawn from the scene. She was never an aggressive leader like her mother-in-law. So, there is no one to match Modi at the national level. Do you think the Congress suffers from existential anguish? Yes. The (Nehru Gandhi) family does not want to give up, at the same time they are not able to fight other parties because they are not like Indira Gandhi. Both Sonia Gandhi and Rahul Gandhi are mild social reform kind of people. They are not aggressive election fighters like Modi. Critics say there is a hidden Hindutva agenda behind the vikas mantra which Modi speaks about. Do you feel so? I am of the opinion that Modi is giving a signal that the BJP will have to become a conservative economic development-oriented political party like the Conservatives in the UK and the Republicans in the US. Not a right-wing Hindu party? No. He doesn't talk much about it except in some places during the UP elections. He doesn't talk about the Ram temple and Hindutva agenda. His economic orientation is right wing while that of the Congress was left of Centre. Both Modi and Amit Shah are linked to the business class of India. Any absolute right wing Hindutva agenda will upset business. Their advisors will advise them not to go on the lines of L K Advani and Murli Manohar Joshi, which can destabilise the system in so many ways. The advisors would tell them to help through an economic agenda and not a religious agenda. If you look at the main administrative apparatus of the Modi government, Dalits, Muslims and OBCs did not get any bigger slots; only lower slots. The Baniyas and Brahmins got the bigger slots. The Congress had given bigger slots to Dalits and Muslims like the President of India, home minister, Lok Sabha Speaker. I don't think Modi will make a Muslim or Dalit President. It was Chandrababu Naidu who insisted that Kalam became President. Modi and Amit Shah will definitely look for a Baniya or Brahmin or an upper caste person who is pliable for them. Even though Modi is an OBC? He is a Baniya OBC. They have an OBC certificate, but they have rolled into Baniyahood. The BJP winning so many states -- is it a matter of concern for you? My worry is though Modi may not go after a Hindutva agenda or temple building or something that destabilises the Constitution, there are any number of sadhus and sanyasis in UP who are itching for temple building. It goes on the lines of America's Trump administration. He (Trump) is not able to control hate crimes. Modi may not behave like Trump, but if his party behaves like Trump, he will not be able to control it. How can he control what party workers do at the ground level? For example, what the ABVP does in universities. It is not an intellectual students' organisation. It can arrange only festivals and not intellectual debates. How can Modi or the central government control such organisations when the party has power in every state? Why do people trust Modi and the BJP? This period is the populist right wing period in the world. India cannot exclude itself from the world. Secondly, all the Muslim nations around India are theocratic States. Look at the way the BJP could muster the support of Muslim women because of their position on triple talaq. Muslim men are patriarchal and conservative, naturally, the BJP's strong stand on this issue struck a chord with Muslim women. The pro-women stand taken by the BJP was not the voice of Advani or Joshi or Vajpayee. Is an ideological shift happening in the BJP? Some people are ideologically shifting. For example, Modi talks about the poor. Arun Jaitley talks about the poor. There is a section in the BJP who talks a different language now. Not the entire party. 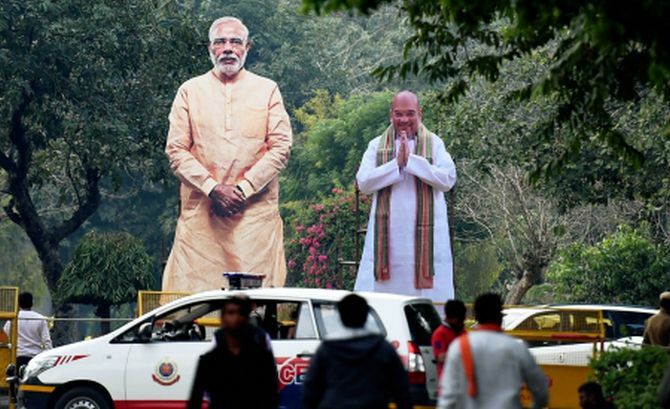 It is a fact that without Modi and Amit Shah, the BJP will not be a winning party. What made the difference to the BJP are Narendra Modi and Amit Shah. Even when Vajpayee was at the Centre, the party was not in control of so many states, especially UP. But even if they set an economic and social agenda, how much will it percolate down to the ground level is the question. For example, the sadhus and sanyasis of UP are not for any economics. They only know the religious agenda and the RSS will support them. Modi does not have the full control of the party at the ground level like Indira Gandhi had. She was fully in control of the Congress party from the villages to Delhi. What kind of a future do you see for the country? My fear is the BJP and the ground cadre may behave like Trump in America. Modi, Amit Shah and certain intellectuals in Delhi will behave like the Republicans. The danger is bigger here than in America. Let us hope India does not go the American way.